Jack Love's personal account of joining up for the RAF, training for, and then flying with RAF Bomber Command in the Second World War. He describes in graphic detail the night he was shot down, the subsequent extraordinary evasion attempt, and provides a fascinating insight into life as a prisoner-of-war. A collection of 30 previously unpublished photographs. In May 1942 RAF Bomber Command observer Jack Love's world comes crashing down, literally. His aircraft sustains flak damage and a catastrophic engine failure forces a crash-landing in Northern France. The pilot manages a safe belly-landing in a ploughed field, and the uninjured crew scramble free of the wreckage, running to safety as flames engulf the Wellington bomber. A five-week trek follows, mostly at night, as they march almost 300 miles across France, seeking the promise of sanctuary in Switzerland. They reach the River Doubs where wireless operator Stan Bradley tragically drowns during an attempt to swim the raging river. Pilot John Beecroft and front gunner Henry Hanwell reach the far bank, and subsequently become part of the now-famous ‘Pat O'Leary' escape line. Jack and tail gunner Alec Crighton, unable to swim, attempt to find a suitable crossing, but stumble into a German patrol. For Jack and Alec ‘The war is over'. 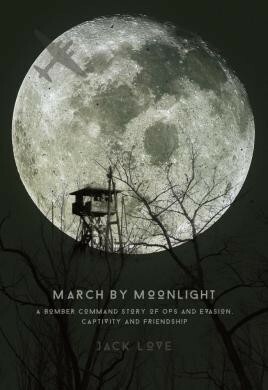 Three years of captivity follow, culminating in the infamous ‘Long March'. While incarcerated Jack wonders on the fate of his fellow crew members. Had they succeeded in reaching safety? It was a question that would be answered decades later when the surviving crew members shared a joyful reunion in Cambridge, only a few miles from where it had all started. March by Moonlight is Jack Love's personal account of the experiences he went through joining up for the RAF, training for, and then flying with RAF Bomber Command. He describes in graphic detail the night he was shot down, the subsequent extraordinary evasion attempt, and provides a fascinating insight into ‘kriegie' life, as he passes through numerous camps, enduring over-crowded and starvation rations as the war draws to a close. Jack Love and his fellow crew mates experienced it all; the perilous bombing operations, the strain of air combat, being shot down, ‘cloak and dagger' evasion, the frustration of capture, and the simple triumph of surviving against the odds. This is their incredible story. An incredible tale, on a par with some of Paul Brickhill's finest accounts of the exploits of the Dam Busters and Douglas Bader, those iconic stories that thrilled and inspired me when I was old enough to read them. This is a tale that is crying out to be turned into a motion picture, a tale that encapsulates everything heroic and inspirational about the second world war. An exciting insight into the lives of young men thrust into battle in the skies over Europe...This is a hair-raising tale of wartime adventure.